Friday, October 12, 2018 – Finishing our big push week for neurology clinic at FAME…. I had felt a stomach bug coming on the night before and, sure enough, it had managed to keep me up part of the night and I felt pretty ill in the morning. I took my GI cocktail consisting of loperamide and azithromycin, that I’ve thankfully not had to use often, grabbed a peanut butter Clif bar and made my way up to morning report, hoping for the best. 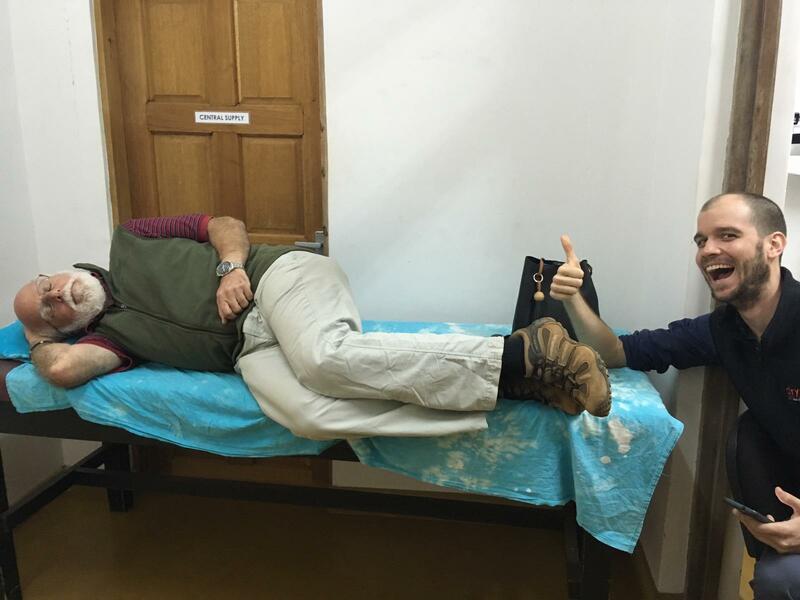 Whether it was the azithromycin or the bug, I felt pretty nauseated most of the morning, along with general stomach cramps, and took the opportunity to lay down on our patient exam table in the hallway where the event was, of course, quickly memorialized (with John photobombing the picture). 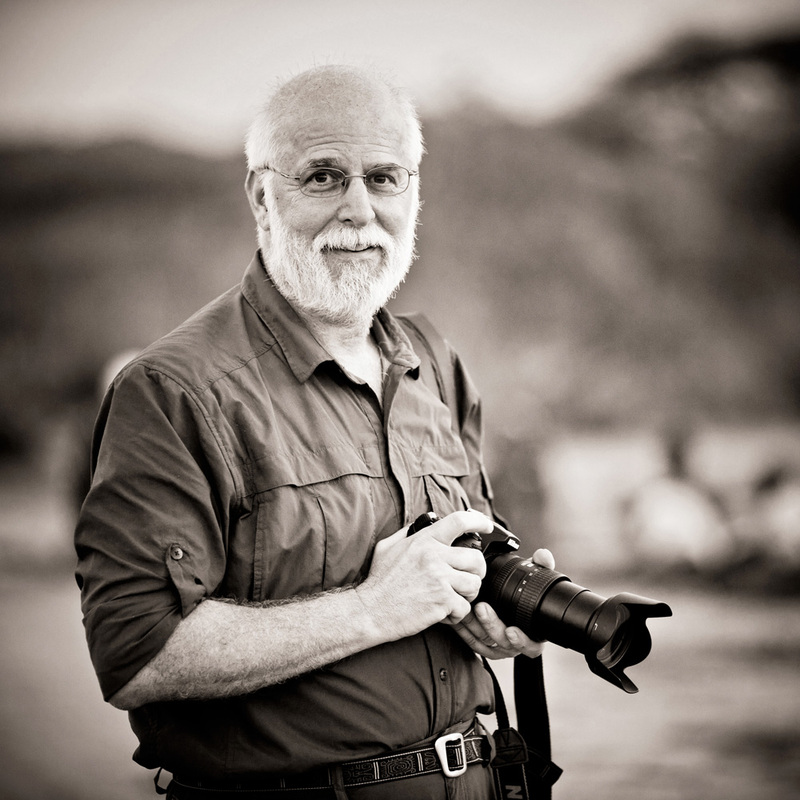 When I stopped by his office, Frank gave me some secnidazole to cover giardia along with some Zofran, but I decided to tough it out with what I’d already taken and, amazingly, after about six hours felt tremendously better and back to my normal self. Having a stomach bug is not an uncommon occurrence here and at least one or two per trip will end up taking a course of azithromycin and loperamide at some point during the visit. This was the last day of our big FAME neurology clinic that was announced to the general community and is where we see most of our patients during the visit here. Tomorrow, we would begin our neurology mobile clinics to the villages in the district, with the first being Rift Valley Children’s Village and the following week, towns in Mbulumbulu and Endabash areas. Most mornings we have had a tremendous number of patients show and thankfully it has wound down over the week so we did not have to turn anyone away today. Our meningitis patient in the ward has continued to struggle as has our ability to confirm his diagnosis, unfortunately. He has had some continued fevers and his mental status has remained poor, though he has not had any further seizures in several days. Our concern is that he was febrile and possibly seizing for five days before presenting to us which is now becoming a bit more worrisome as he may have suffered significant injury before having arrived here. We will continue his antibiotics for now and have decided to obtain a CT scan as soon as ours is operational as it has been down for the last week due to a power supply failure that will require a visit from GE to fix. One of the early patients today was a young child that had come from Arusha to see us for possible autism. They had not been aware that they needed to register and we had come close to our maximum for the day that meant they may have to wait until the afternoon to be seen. Considering he was clearly somewhat hyperactive and running all over the place, it was probably to our benefit to see him sooner than later and this was certainly not unreasonable considering their confusion in not having registered. Amisha walked past him on several occasions over the morning and in doing so, she pretty much confirmed her suspicions that the child was indeed on the spectrum. When they finally got in to see us, she spent a great deal of time counseling his mother on how to work with him and what he would need for the future. He was already in a special school in Arusha and they were accompanied by a worker from the school who was also interested in what the child needed. 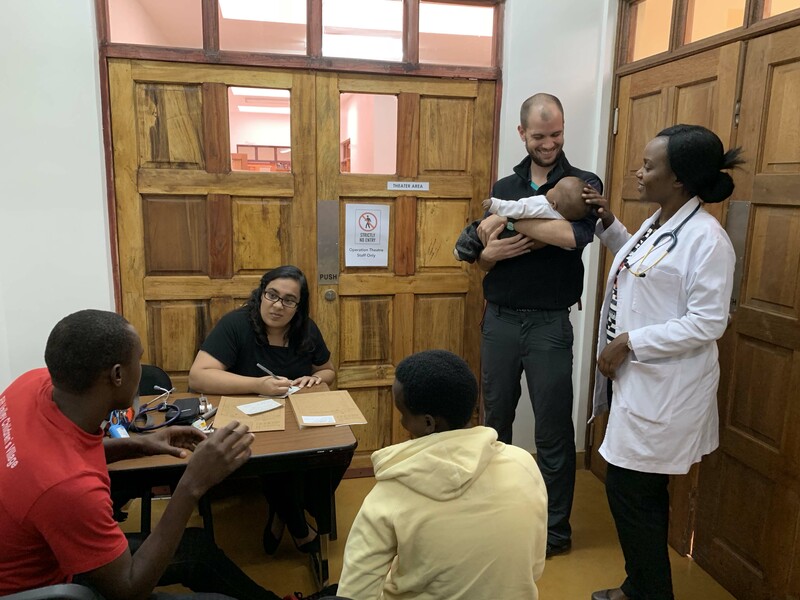 Thankfully I had remembered from our last visit that Dr. Gabriel had reached out to a special rehab center in Arusha that deals specifically with children on the spectrum so we were able to give them the information on how to contact this program. Hopefully, this will help going forward and provide him the therapy that is needed over the next years. 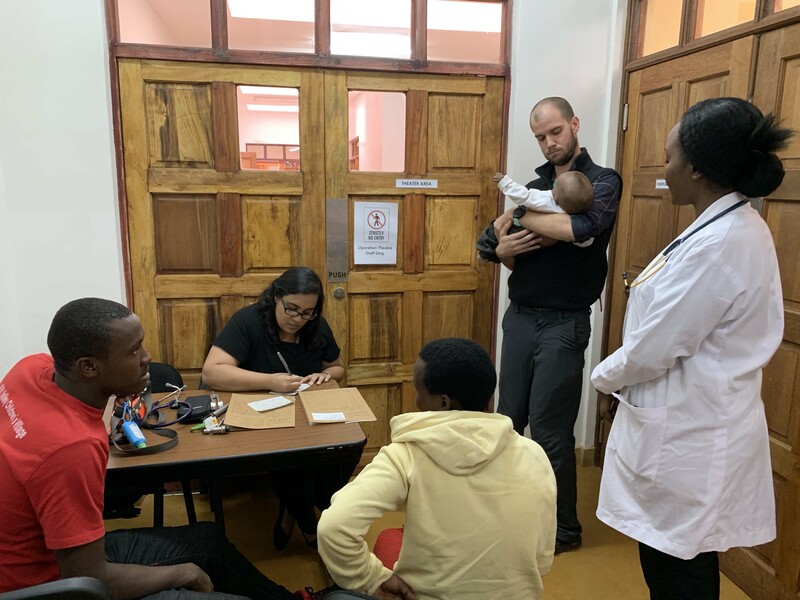 Our clinic runs in a very similar fashion as our resident clinic at home and, as I have mentioned before, we are running three exam rooms until our registration desk has freed up when we can create a fourth examination “room” in the entrance way of the emergency room. 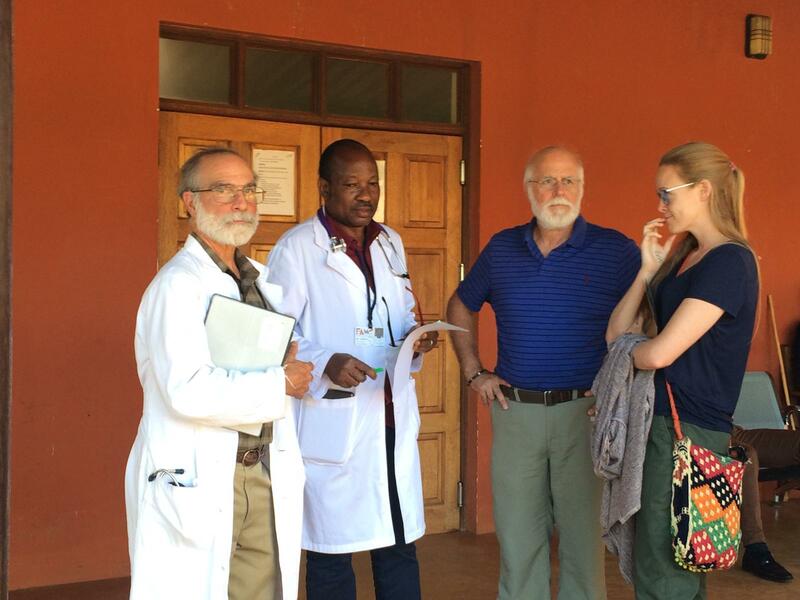 I am typically standing outside to hear about the patients from each of the residents after they have evaluated them and formulated a plan of action. 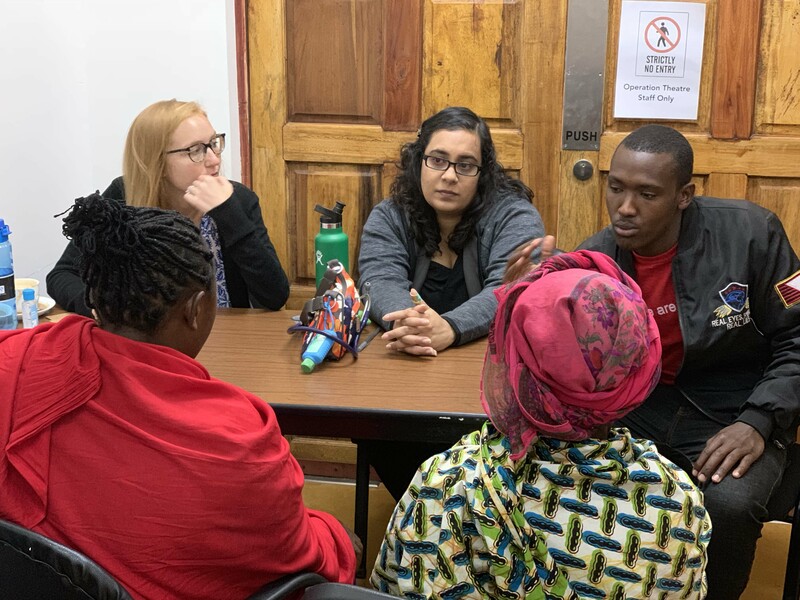 As they present each case, most often with the clinician working with them (or in the case of Shaban, a fourth-year medical student at Muhimbili University here in Tanzania), I am able to do some teaching regarding the disease or treatment course. Sometimes, I may go over part of the examination with them, but most often it is not necessary, and the resident can merely finish up with counseling and giving whatever prescriptions are necessary. Today, an ambulance arrived midday to bring a patient to FAME who was reported to have eclampsia. In general, ambulances are not seen very commonly in Tanzania and, to be honest, I’m not sure if they are private or government supported. The staff rushed out to unload the patient and she was immediately brought to Ward 2 which is the maternity ward for the moment until the new maternity wing is finished. This new building will have 25 beds with multiple labor rooms compared to the current ward which has perhaps 7 or 8 beds, two labor rooms and a room for neonates in incubators. The new maternity facility is a much-needed addition to FAME which has been growing in its number of births annually since the first in 2014. Doug Smith, a prior pediatric neurology fellow who accompanied me here in 2014, was the pediatrician who attended the very first delivery at FAME. Half-way through the day, Siana, our head nurse, came to see me about a patient who had been brought from Arusha and asked if we could possibly see the patient on the OPD (Outpatient Department) side so as not to disrupt our clinic or cause issues with those patients who had been waiting to be seen. The woman had been displaying psychotic behavior and her family had brought her from a fair distance to see us and given the nature of the problem, I thought it best to honor Siana’s request as she is someone who has worked here from the very beginning and rarely, if ever, asks me for a favor. The patient had a very good story for a post-partum psychosis, but was also very depressed which complicated the picture a bit. In these cases, it can be touch to tell whether the depression is primary (as it is so common) and she has psychotic features, or whether she has a primary psychosis and the depression is secondary. As a rule, we rarely start two medications at the same time as then you don’t know which one is working if the patient improves and should they have a side effect, you’re limited in your ability to tell which medication caused it. As the antidepressant would take much longer to work, we chose to put her on the antipsychotic medication first and monitor her. Depending on her response to that medication, we will decide whether or not she should start the antidepressant at a later date. Dr. Julius came to us in the afternoon with a child who had severe anemia and was very, very sick. This wasn’t a neurology case, but Amisha (in her gen peds mode) and Steve began to work on the case to come up with a diagnosis. 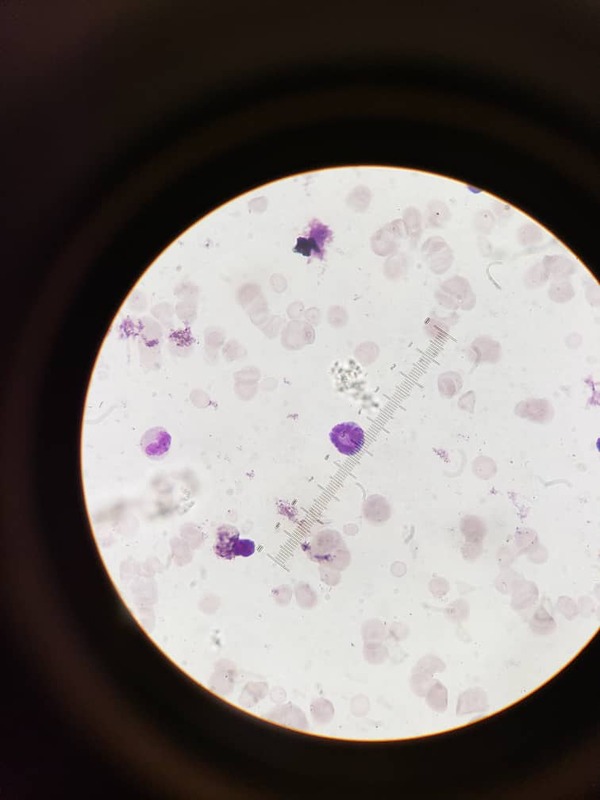 The child was found to have hepatosplenomegaly (enlargement of the liver and spleen) which narrowed the differential a bit, but it was necessary to do a blood smear to narrow it down further. 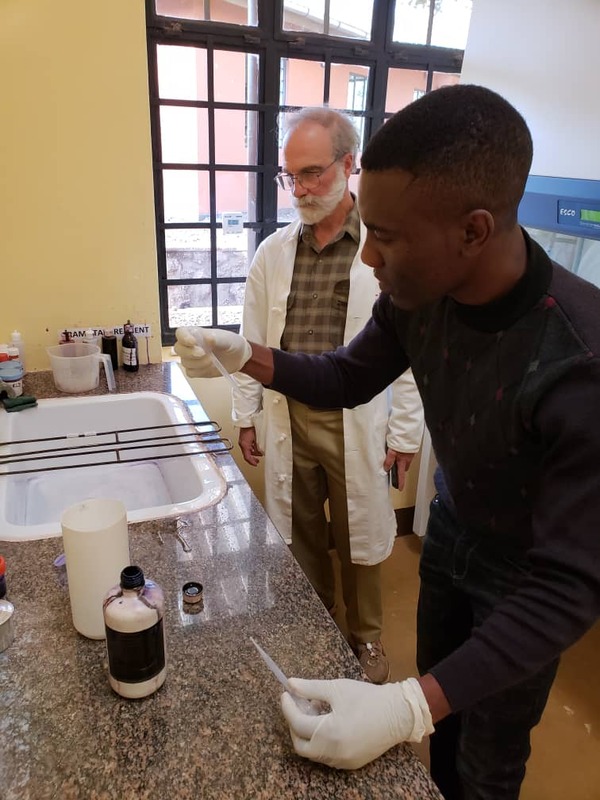 Steve went into action, taking Amisha and Hannah with him to the lab and helping to get the blood smear prepared and read. Unfortunately, the slide was loaded with atypical lymphocytes suggesting that the child suffered from either lymphoma or a lymphocytic leukemia. Further investigations would be necessary, but in the meantime, the pediatric oncology service in Muhimbili would be contacted to arrange for the child to be seen in Dar es Salaam. We finished with enough daylight left to head into town to do some shopping for groceries as John had planned to make General Tso’s chicken on Saturday night after our return from mobile clinic. Our dinners are prepared for us on Monday through Friday, though we are left to fend for ourselves on the weekend nights, which is really not a problem as it often gives us an excuse to have a nice meal as we did at Gibb’s Farm last Saturday. We were looking for some frozen boneless chicken breasts and John was having a heck of a time finding any as they weren’t available at our normal market. I should say that the street on which we shop has little markets one after the other that all carry the same supplies and it is entirely unclear to me why anyone would necessarily choose one market over another, unless of course one was owned by a family member or something. Our little market (where FAME does most of its shopping) is Deus Super Market (Not to be confused with the Deus Mini Market which is only several doors down) which is a small shop about the width of two tiny aisles with shelves on both sides and is about 15 feet before it steps down to an area where the freezer is along with other stock. John walked up and down the street looking in different shops, as well as enlisting the help of one very nice shop owner who took him to a local butcher, but in the end, he opted for the frozen whole chicken that we’d defrost in the refrigerator and he would chop up without the benefit of a meat cleaver or good butcher knife. He also found all the necessary vegetables in the vegetable market and Hannah and Amisha went on a mission to buy bulk rice. We traveled home well after dark, some of us having eaten already and others still needing to eat. The stars were once again magnificent with the milky way forming a brilliant swath across the night sky and the planets shimmering brightly as if you could reach out and touch them. The constellations look as they actually should here and it is far easier to learn them when you can make out their shapes with far less imagination than is necessary at home. We are all looking forward to seeing the stars while on safari in the Serengeti where it is truly the darkest that one can possibly imagine. We have been feeling a number of fairly substantial earthquakes that have occurred while we’ve been here, none that have been strong enough to have caused damage, but certainly will get your attention. It is not at all surprising, though, considering that the area here is entirely volcanic with several active volcanoes in the near vicinity (Ol Doinyo Lengai, or the Mountain of God to the Maasai, is one such mountain that erupted here in the last several years) having erupted recently enough for people to remember. Having grown up in the San Fernando Valley of Southern California, I was quite used to earthquakes having felt hundreds and lived through one large one in 1971 and then moving to Mammoth Lakes, California, working for the Forest Service after college and during graduate school, where earthquakes were a nightly occurrence and our main road out of town doubled as an earthquake/volcanic eruption evacuation route. Still, there is just something unsettling sitting through an earthquake as you’re just never quite sure when it’s going to be over. 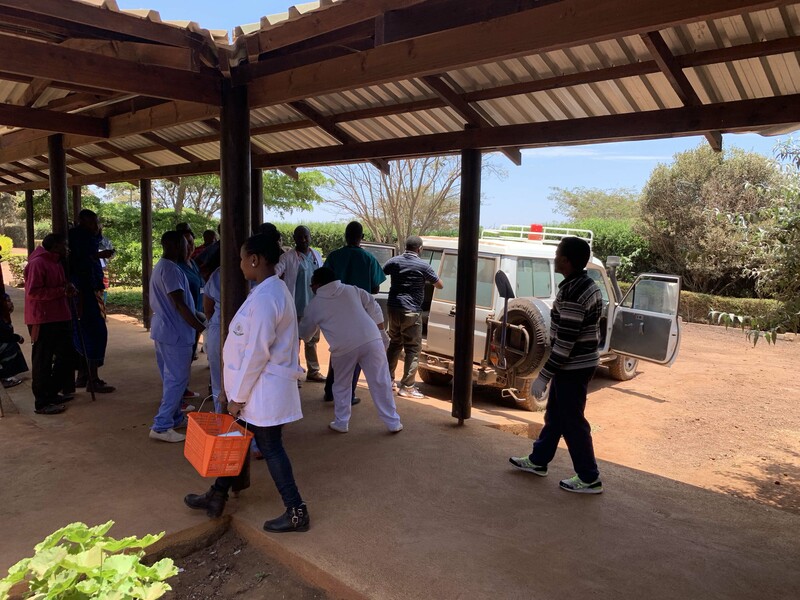 We were heading to Rift Valley Children’s Village in the morning for our first mobile clinic, and it is always a bit hectic making sure we have everything that we need in regard to supplies. I had asked Patricia, a nurse here at FAME and who has accompanied me on numerous mobile clinics, to make sure that the box of medications and supplies were ready for us as she was off for the weekend. Angel was also away tomorrow, so Kitashu would be coming with us instead and organizing the clinic. I think everyone was looking forward to RVCV which is always an inspiring visit. 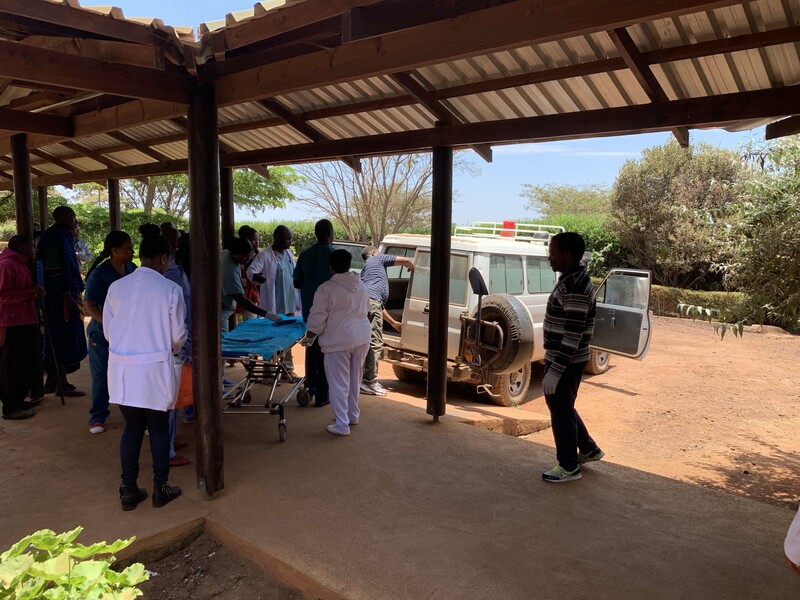 Saturday, October 13, 2018 – Another visit to Rift Valley Children’s Village….